After a lapse due to home renovations, I can once again take time to reflect on the many musical events I hear in Montreal. The new year is off to a great start. Music in the crypt. Dowland - that melancholy man - wrote music that suits the atmosphere of the dark room. The only light in the crypt came from the lamps which lit the music for the performers as well as some candles. The atmosphere was sombre and yet warm at the same time. The Seven Lachrimae were interspersed with more cheerful galliards and poetry in both English and French recited by Sean McCutcheon and François Filliatrault. Les Voix humaines - now 5 viols (Susie Napper, Margaret Little, Elin Soderstrom, Melisonde Corriveau and Jivko Georgiev). and joined by lutenist, Sylvain Bergeron, have a warm blended sound. Lute with viols provided a nice contrast - the plucked strings vs the bowed. The acoustics in the crypt are wonderful. In this small space you can almost feel the vibration of the strings. The concert was short, - too short. I wanted the music to continue to weave its magic. But Susie Napper continued to astonish us with a snack following the concert - delicacies prepared in her kitchen. Many chefs would be envious of her culinary ability. posted by susanvg at 3:07 p.m.
Just a few quick comments. This was a delightful concert. Planned as a palendrome with the second half approximately a mirror image of the first, we were treated to love songs, hunting songs, sorrowful songs... The ensemble have a polished sound. They can be serious, playful and lyrical. I thoroughly enjoyed the concert. posted by susanvg at 6:47 p.m.
Arion was joined by musicians from Il Concerto Suave, featuring soprano Maria Cristina Kiehr. She has a rich stong voice and sang for the greater part of the concert. The concert began with Correa Nel Seno Amato, a cantata by Alessandro Scarlatti. I did not find the piece that interesting. In parts it was quite repetetive. Kiehr's voice was particularly nice in the lower register. I found it less satisfying in the upper range of her voice. The extracts from the oratorio Il Primo Omicidio were more interesting. It started with a beautiful solo violin part. The orchestra sounded great throughout. The concert could have used more variety in the selection of music. This is the second season for Autour de la Flûte. It is delightful to go to a concert with so many young musicians. I have seen a number of them play with some of the larger ensembles (Arion, SMAM) and here they got to shine. The future of early music in Montreal is assured. The concert opened with a concerto for quartet plus continuo by Evaristo Felice Dall'abaco, a composer I was not familiar with. It was a pleasant piece, well-played, but not extraordinary. This was followed by a concerto for flute and orchestra by Vivaldi: La Notte. Mika Putterman's playing is lovely. Her tone is pure and strong. Despite this, there were times when the other musicians overpowered her. Pieces in the concert were interspersed with a solo flute rendition of "le Printemps" from Vivaldi's Four Seasons, which was arranged by Jean-Jacques Rousseau. While it was beautifully played, I did not particularly like the arrangement. I missed the variety of textures of the string quartet and having just a melody instrument left holes in sections of the piece. That said - I was impressed with Mika's playing. Her fast passages sounded like more than one instrument was playing because of the different colours of the registers. I think this is probably an interesting piece to play, but it is not necessarily a concert piece. This is a well balanced ensemble. I particularly liked the playing by the cellist, Karen Kaderavek in the Vivaldi Concerto for flute and orchestra. She provides a punchy continuo line. I enjoyed the second concerto (no. 7 in C major) by Dall'abaco more than the first. It was nice to watch the interplay between the muscians. There was a tremendous sense of communication between the parts. I am so impressed with Mika Putterman's playing. In the Vivaldi concerto for piccolo and orchestra in D major she played on a baroque piccolo. She creates a nice bright sound, each note clear and ringing. It is nice to know we have so many gifted young musicians in Montreal. I have lots of musical soirees to look forward to. posted by susanvg at 6:35 p.m. The lights dimmed and a drone, soon joined by a simple melody, began the concert, transporting us back through the centuries to medieval Spain. Eight viols filled the hall with their rich, mellow sounds. It was lovely to hear such a large ensemble. A lively rendition of Ortiz's Ricercada Secunda changed the mood. The lights got brighter and the rhythms got more complex. 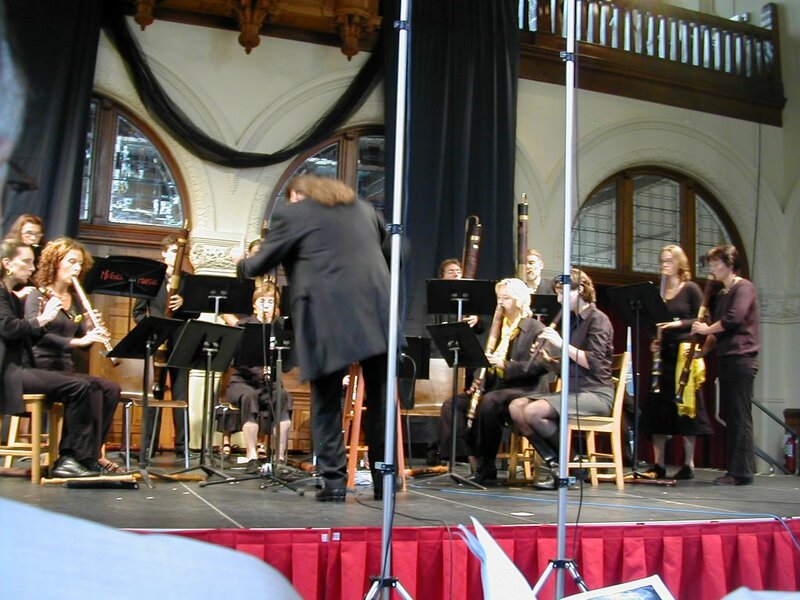 This concert was dedicated to the memory of Peggie Sampson, a pioneer gamba player in Canada. Nine viola gamba players paid tribute to her legacy in a most fitting fashion. Suzie Leblanc introduced "The Leaves be Green" with an a capella version of the tune prior to the Byrd version for 5 viols. This is a complex piece with the melody moving from voice to voice. It would have been nice to be able to follow the melody a bit more, but viols create quite a dense sound and do not always leave sound space for others. I love the lush sound of the viols and there were many lovely moments. In the Dowland set, the lute and harpsicord provided good contrast to the viols - the plucked sound leaves more space between the notes. Suzie Leblanc always charms with her pure, clear voice. Kuijken, as he did in the concert on the 19th demonstrated his virtuosity. He is a very lyrical player and in the Adagio section of the piece by Carl Friedrich Abel played exquisitely quietly, creating an amazing sense of intimacy. The Cryes of London was fun to listen to . The viols played a lovely 4 part interchange. Over it, Suzie Leblanc sang a litany of the goods for sale in London. Suzie took on the voices of some of the characters who might have been selling items in 17th century London. I was very impressed with Nan Mackie's playing in the Adaskin Adagio and Allegretto. The piece brought out different facets of the viol from the use of very high notes, to bowing and plucking at the same time, to changing the pitch while playing. The piece was sometimes a challenge to listen to, but I did find it interesting. I particularly enjoyed the piece by Matthias Maute, Tell Me, True Love. The viols, at times meditative, at times energetic were overlaid with an interesting vocal part. I would love to hear it again, though I don't know when I will have the chance to hear so many viols together in one concert again! posted by susanvg at 12:40 a.m. The days are getting shorter; the air is nippy. Halloween is approaching. A perfect time for a visit to the Gloomy Forest! The concert started with a plaintif air of that name. It would have been nice to have a translation of the lyrics. After the fact a short précis was given, but it meant that listening to the song lost something. Stephanie Conn has a beautiful voice - well suited for this repertoire. I think Celtic music is univeral. It is simple in terms of the melodies and speaks to the emotions common to all people - joy, sorrow, longing, hardshop. When it heats up to a frenzy, it is impossible to listen and keep from smiling. The rhythms cast a spell, leaving everone in the audience incapable of sitting still: heads nod, hands move rhythmically, feet tap, fingers drum. Tunes for the Birds - a set of tunes followed the opening. The combination of instruments created a variety of colours. I loved the sopranino birdsongs. The gamba's deep sounds often provided the perfect foil for the singing violin, especially in My Bonnie Laddie. The guitar and metallaphone in Ailean, Ailean created the perfect mood for the song. In the forest set, each musician played with the melody, bringing their instrument's unique sound to the music. The gamba, played with a alternating plucking and bowing drove the rhythm and the set ended with a lively reel, punctuated by Stephanie's clogging. 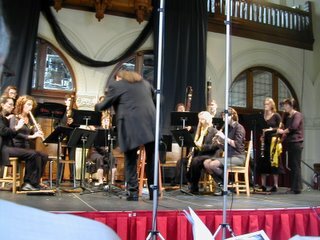 The second half of the concert started with Black Jock (a slow jig with variations). David Greenberg slowly made his way from the back of the church. Once on stage, the variations became more spirited. Greenberg's playing was virtuosic; he is indeed a master fiddler. Afterward's he explained that he needed 4 different tunings for this concert, but only had 2 violins, so occasional retuning was part of the concert. Puirt a beul was a set of tunes of the mouth, often sung when no instruments were handy. In this case it was a duet for violin and voice. The lively sounds, which got faster and faster kept everyone moving. The stately bagpipe playing in Air lady Isabella Weymess provided a striking contrast in mood. The concert may have been called The Gloomy Forest, but if I can find a gloomy forest where this music is found, I'll go there happily. posted by susanvg at 8:22 a.m. It's hard to believe it is already the twentieth season for Les Voix humaines. They started it on a high note! With guest artist, Wieland Kuijken, this was a concert of rich-sounding viol music. it opened with a solo played by Wieland Kuijken, a prelude and chaconne by Sainte-Colombe. The piece made good use of the low register with resonant deep notes. Kuijken's tone is gorgeous and the viol sang until the last note faded away into nothing. After reading the information on Forqueray, I did not feel kindly towards the composer. His personality was difficult and his behaviour scandalous - not much to recommend. Fortunately, his music was lovely. Kuijken was joined by Nigel North on lute, Eric Milnes on harpsicord and Susie Napper on viol - a splendid continuo section! Kuijken can make his viol sing as in La Rameau and then whisper with a quiet intimate sound as in La Léon. The church was hot, the music mellow - the perfect combination for drifting into semi-consciousness - but sometimes that is a great way to listen to music. The lute and harpsicord added a bright sound which contrasted nicely with the viols. The second half of the concert began with solo for theorbo, played by Nigel North. The acoustics of the church, from my vantage point, were excellent for the lute. I really enjoyed the contrast or the light lute sound after the richer and heavier viol sound. In the Couperin suite which followed there was a nice use of different instruments on the continuo lines. It created a variety of colours and textures which created different moods for each movement. Kuijken's viol playing is very expressive. I particularly like the way he treats slow passages. He sometimes played so quietly, you had to really listen for every note. It pulls the listener in. All in all a lovely concert. posted by susanvg at 8:20 a.m. It is always a good experience to watch a master class. I admire the musicians who have the courage to play in front of the auditors and take the suggestions and try to put them into practice immediately. Each teacher I have watched has a style of his/her own. Dan Laurin did his best to put each participant at ease. He is incredibly knowledgeable, not only about the music but about the various periods that were represented by the pieces that were selected. As I enjoy history, particularly the social aspects, I particularly appreciated his elaboration of the thinking in different time periods and how it affected the music that was created. His comments ranged from practical suggestions regarding footware and glasses to suggestions regarding ensemble playing and thoughts about interpretation. Dan Laurin encouraged each player to dig deeper into themselves to let the music out. Participants and auditors left with much to think about. posted by susanvg at 11:26 a.m. The concert was appropriately named as the recorder orchestra, Praetorius, flew in for rehearsal and the concert and then flew home. It was an intense time for them as not all the ensemble was able to come, so many players were on parts they had not rehearsed before. They spent many hours rehearsing while in Montreal. The theme The Flying Dutchmen, celebrated the height of the Dutch mastery of the seas, during their days of exploration and trade in the Dutch Golden Age. A phantom ship brought fear to many. These flying Dutchmen, instead brought pleasure. 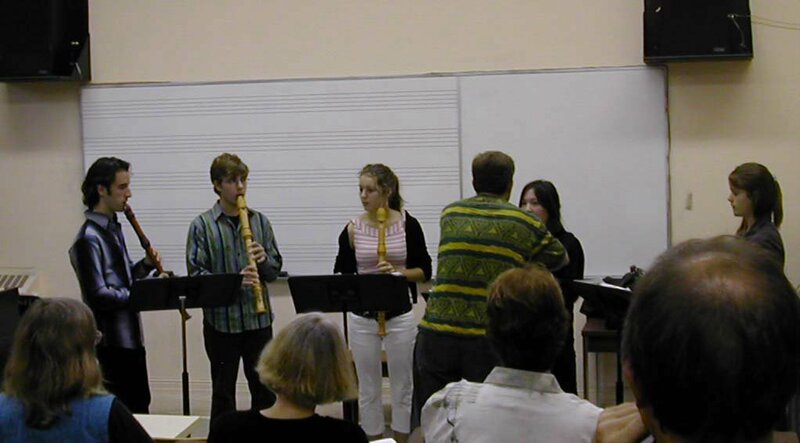 The group started with a Sweelinck fantasie, playing on a matched set of Renaissance recorders. The effect was like listening to an organ. The group has a number of low instruments (down to the sub contrabass) which makes for a full, rich sound. This is a well-rehearsed group with consistent articulation throughout the ensemble. There is precision in their playing which makes for wonderful ensemble playing. As in the Sweelinck, the effect is of listening to a large pipe organ, rather than a collection of instruments. All those people who think of recorders, only in terms of the high soprano, should hear this group. There was an interesting variety of music. The change in sound was marked as they moved from the Renaissance to the Baroque instruments. The Ruppe (I hope it was this one - announcements were blurred) at times sounded like a calliope. The Schuyt, with more of the higher recorders sounded celestial. The concert was tied together by some interludes of recorded music which allowed the musicians to change places and instruments. I found the music, which was meant to give cohesion to the concert, interfered with the experience. It was too loud and not in character with the feel of the other pieces. The pieces were announced by microphone, but it was not always easy to hear what was next as the announcement blended in with the transitional music. Matthias Maute joined the orchestra as a soloist in a Schickhardt concerto. The playing was excellent; the orchestra did a nice job of accompanying the soloist but I found the choice of a solo recorder with recorder accompaniment did not provide enough contrast in sound and colour. There was a nice interplay between the soloist and the "first alto" from the orchestra. Although the members of this ensemble are amateurs, they take music very seriously and it is obvious in their playing. Although they had to deal with playing new lines, they played well. Though there were sections that were a little uneven, the overall effect was very satisfying. I would love to hear the entire group in concert in the Netherlands. Who knows? Perhaps for ICRO in October 2006.
posted by susanvg at 11:23 p.m. 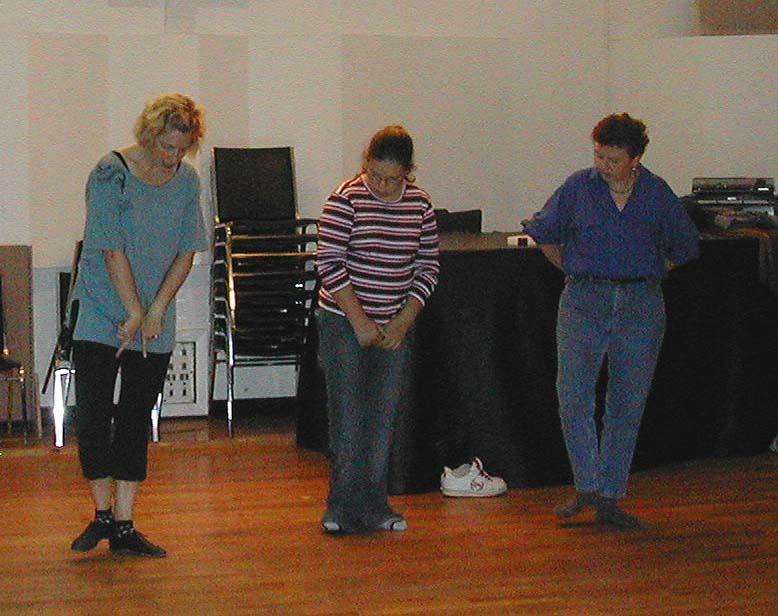 While the performers rehearsed, the amateur participants enjoyed workshops. In the morning there were several groups of varying levels working with workshop leaders. It is always satisfying to play in small ensembles. The wet weather ouside did not dampen the enthusiasm of the participants. Recorder enthusiasts came from Montreal as well as other parts of Canada and the U.S. Participants could also visit the exhibition. Jean-Luc Boudreau had a variety of recorders on display, including his new bass recorder (I have to keep a lock on my wallet). I was not able to resist a couple of CDs by the performers at the festival. In the afternoon we were treated to a baroque dance workshop, directed by Marie-Nathalie Lacoursière. Within an hour she had us dancing a minuet, perhaps not as fluidly and gracefully as our predecessors of the baroque era, but nonetheless with our own style. There was little time for rest. 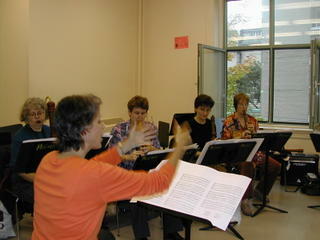 Later in the afternoon there was a workshop with Matthias Maute. Within an hour we prepared a few pieces which were performed as the audience arrived for the evening concert by Caprice and Rebel. A full day of musical challenges and experiences. posted by susanvg at 10:55 a.m.
Share my love of Early Music. Find out what is happening in Montreal through the eyes of a "Front Seat Lady"